Five student musicians from Lawton C. Johnson Summit Middle School (LCJSMS) were chosen by the Central Jersey Music Educator’s Association (CJMEA) to play in junior regional bands. John Cho (8th grader) made 1st trombone, making him the top trombonist in the region. Brian Axtell (8th grade) and James Ritter (8th grade) were made 2nd and 3rd trumpet, respectively. Clarinet players Ian Ritter (8th grade) and Jamie Eck (7th grade) garnered spots in the Wind Ensemble and Symphonic Band. 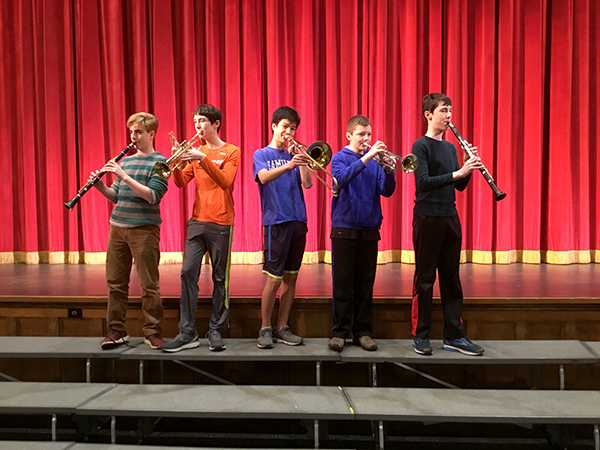 All five students will perform in a concert in March with the best middle school instrumentalists in the region. “We are so proud,” said Rebecca Hoffler, Instrumental Music Teacher at LCJSMS. (above, l-r) Jamie Eck, James Ritter, John Cho, Brian Axtell, and Ian Ritter will represent LCJSMS in CJMEA junior regional bands.